An elderly couple has reached a settlement with Spike Lee after the pair said they had to leave their Florida home after the director help spread a Twitter posting listing their address as that of the man who shot an unarmed teen. The couple's attorney, Matt Morgan, announced the settlement Thursday. Morgan says Lee called them to apologize for retweeting their address. Specifics of the settlement weren't disclosed. Elaine and David McClain are in their 70s and say they have a son named William George Zimmerman, who lived in their Sanford area home in the mid-1990s. They say he is no relation to 28-year-old George Zimmerman, who killed 17-year-old Trayvon Martin on Feb. 26. 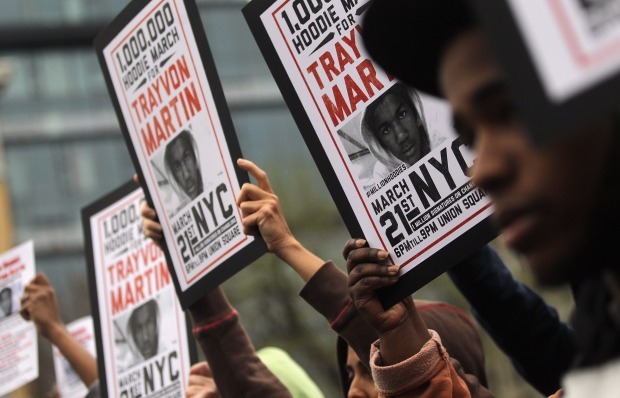 The killing has touched off widespread protests around the country and expressions of outrage — including from Lee and other celebrities — because Zimmerman was not arrested. The neighborhood watch volunteer has said he acted in self-defense. "At this point in time, we have come to an agreement with Spike Lee and his attorneys, and at this point, the matter is fully resolved," Morgan said. "Spike has agreed to compensate the McClains for their loss and for the disruption into their lives. He's taken full responsibility." Lee tweeted late Wednesday: "I Deeply Apologize To The McClain Family For Retweeting Their Address. It Was A Mistake. Please Leave The McClain's In Peace." Morgan added that Lee also called the McClains to apologize personally. "He was really kind," Elaine McClain said. "And when he called us, you could just tell he really felt bad about it. And it was just a slip, and I just know that he really, really has been concerned." A production company representative for Lee in New York had no comment.